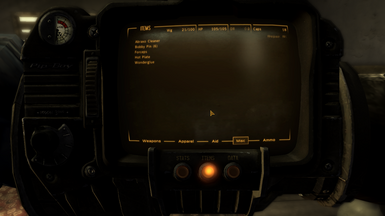 Personalizes and partially randomizes the starting equipment Doc Mitchell gives to the player in the tutorial section. Feel free to use this in whatever compilations or projects you want. I would appreciate credit, but it is, as always, just a courtesy. This little mod started as a personal project to breathe some spontaneity into the character creation process. I figure I've been using it long enough that one could consider it pretty well-tested, and the results as of writing this seem worthy enough for the discriminating palate of my fine Nexus pals. The player wakes up with a patient gown, which is subsequently removed when Doc Mitchell hands over his old Vault suit. The obvious corollary to this is that this mod requires Old World Blues. But then, you should have Old World Blues anyway, so it's fine. Old World Blues owns. All players receive a decent starter kit, composed of 6 bobby pins, 18 caps, 4 stimpacks, a pair of binoculars, and 2 random miscellaneous items for flavor. All players receive a random hat and a random outfit (presumably what they wore to the grave.) Nothing high-level, and nothing that provides any unfair stat boosts that couldn't also be acquired by looting Doc Mitchell's house. The player will still receive the Vault 21 starter outfit as normal. I don't consider this lore-breaking; the way I figure it, Mitchell is just being courteous by providing the player with an alternative outfit that isn't caked in dirt (and blood and brain matter, and the works). All players start out with a caravan lunch, two purified waters, 2 random food items, and 1 random drink. This is definitely a good handful of food, but it's not significantly more than the player can pilfer from Mitchell's house. For players like me who prefer to not rob the good doctor blind, this makes things more painless. Not to mention, it's a more plausible meal plan for a Vegas-bound trek across the desert than a handful of stimpacks. If the player has taken the Four Eyes perk, they will receive and immediately be equipped with a pair of reading glasses. There's already a usable pair in Mitchell's house, but again, I prefer not to rob the old boy. Depending on whether the player has tagged Science, Medicine, or Survival, they will receive a small portion of different aid and miscellaneous supplies. For the sake of keeping players from tagging all three and then receiving a ridiculous amount of aid, you'll only be able to reap the benefits of one. The output's order of priority is Medicine > Science > Survival. The Medicine output is 2 extra stimpacks, 1 doctor's bag, and 1 random surgical item. The Science output is 2 Hydras, 1 random surgical item, and 1 random miscellaneous "science-y" item. Hydra is a pretty powerful chem to have two of, and most of the "science-y" items can sell for a decent starting profit, so that's how I justify this one. The Survival output is 2 antivenoms and 2 random steaks. If the player has tagged Explosives, they will start with 6 sticks of dynamite and 2 powder charges. If the player has tagged Unarmed, they will start with boxing tape as opposed to a pair of boxing gloves (a pretty silly weapon of choice.) If the player has tagged Melee Weapons, they will start with a police baton as opposed to a straight razor (a bit of a flavor choice for me, but I think it makes more professional sense for a Courier to prefer a standardized, dedicated bludgeoning tool over a barber utensil as their weapon of choice.) The output prioritizes Unarmed. And yeah, that's about the whole nine yards. JSawyer Ultimate Edition﻿ by PushTheWinButton﻿ or Couriers Stash Integration﻿ by TheSilenced﻿ because otherwise you're already going to have enough starter loot to sustain a small town militia, and this whole venture will have been pointless. And with that said, I also recommend that you load this after JSawyer. Clean Character Creation by mastahbossu﻿ or Character Creation Streamlined by Ladez﻿ to make the process that much swifter. I recommend that you load my mod after Ladez's, though, or you'll risk not receiving your specialized loot. Simple DLC Delay﻿ by mastahbossu﻿ because it never hurts to lose all the message spam. In case you are respectfully unimpressed or otherwise turned off by the array of changes this mod provides, may I suggest the following alternatives? Patient Gown at Startup by TheCalculator﻿ in case you were just here for... well, the patient gown on startup. Idk, maybe! Like I said, this was a pet project, and it's just the least bit sloppily thrown together. But for right now, I do think there are still a few extra features I could work in there at some point if I ever find the time and motivation. We'll see!